The Seahawks signed Lynch on Thursday, Sports Radio KJR reports. Lynch worked out for the Packers on Tuesday, Rob Demovsky of ESPN.com reports. Analysis: It's not clear if the Packers took a look at Lynch for any other reason than they wanted to evaluate him as a prospect, but it does at least lead to more speculation that the Packers are considering shutting down starter Aaron Rodgers for the rest of the season. Lynch remains a free agent for now, but if the Packers do decide to call it a season for Rodgers, Lynch is presumably the favorite to take his place on the roster. Lynch is slated to work out for the Bills on Tuesday, Ian Rapoport of NFL Network reports. Analysis: The Broncos recently cut ties with the No. 26 overall pick in the 2016 NFL Draft, but he figures to catch on elsewhere as a backup. The Bills have current starter Nathan Peterman, as well as 2018 first-rounder Josh Allen on hand, so if Lynch were to sign with Buffalo, he'd be the team's clear-cut No. 3 option. Alternatively, the team may just want to kick the tires on Lynch, with an eye toward having him on a short list of potential replacements should either Peterman or Allen suffer an injury. Lynch was cut by the Broncos on Sunday, Tom Pelissero of NFL.com reports. Analysis: Lynch survived cutdown day but didn't have a spot on the team after the Broncos claimed Kevin Hogan off waivers. The 2016 first-round pick may have a chance to latch on elsewhere as a developmental project. 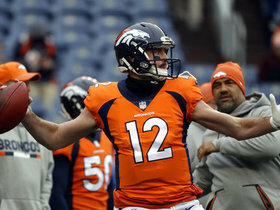 Lynch survived roster cuts as the Broncos' No. 3 quarterback, ESPN.com's Jeff Legwold reports. Analysis: Lynch still has a spot on the team but will be stuck behind Case Keenum and Chad Kelly on the depth chart. It won't come as a big surprise if the Broncos eventually release the 2016 first-round pick out of Memphis. Lynch is expected to play the entire second half of the Broncos' fourth preseason game Thursday, Troy Renck of Denver 7 News reports. Analysis: Lynch's demotion throughout the preseason has been widely publicized, and the decision to play him behind Chad Kelly on Thursday suggests the Broncos are ready to move on from the former 2016 first-round pick. Playing well against third stringers in the second half of the fourth preseason game yields no upside for Lynch. Lynch was overtaken by Chad Kelly as the Broncos' No. 2 quarterback, Ian Rapoport of NFL Network reports. Analysis: Lynch was abysmal in Saturday's preseason game against the Vikings, completing only 6 of 11 passes for 24 yards and an interception. Kelly, on the other hand, looked much more impressive and totaled more yards on the ground (three carries for 38 yards) than Lynch had through the air. The 26th overall pick of the 2016 draft was the de facto backup quarterback after the Broncos signed Case Keenum in March but now finds himself practicing with the third-string offense. Lynch will enter training camp vying for the backup spot, James Palmer of NFL Network reports. Analysis: Lynch has struggled to get off on the right footing in Denver, but that doesn't mean the team is throwing in the towel just yet. After passing on a signal caller in the draft, Denver intends to have Lynch battle Chad Kelly for the No. 2 quarterback spot behind Case Keenum. The 2016 first-rounder appeared in just two games last season. 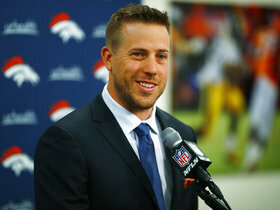 The Broncos' adjusted scheme will be suited to complement both Lynch and new starter Case Keenum's skillsets, according to the team's official site. Broncos coach Vance Joseph said Friday that Lynch is the team's No. 2 quarterback, Nicki Jhabvala of The Denver Post reports. Lynch likely will remain with the Broncos in 2018, but his presence on the roster won't stop the team from seeking an upgrade at quarterback, Nicki Jhabvala of The Denver Post reports. Lynch completed 30 of 45 passes for 295 yards, two touchdowns and three interceptions during 2017. He added 30 yards and two fumbles on five carries. Lynch completed 21 of 31 passes for 254 yards, two touchdowns, and two interceptions during Sunday's 27-24 loss to Kansas City. He added 13 yards on three carries and lost a fumble. Broncos head coach Vance Joseph confirmed that Lynch (ankle) would start Sunday's game against the Chiefs, Zac Stevens of BSNDenver.com reports. 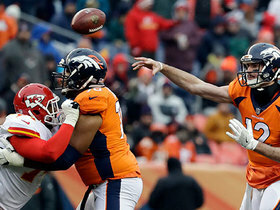 Broncos head coach Vance Joseph reiterated after Sunday's 27-11 loss to the Redskins that Lynch would likely start Week 17 against the Chiefs if the quarterback's sprained ankle cooperates, Aric DiLalla of the Broncos' official site reports. "Our goal is to see [Lynch] play, so absolutely," Joseph said. "If he's ready to go next week, he will probably play for us." Lynch (ankle) is active for Sunday's game against the Redskins, but will dress as the backup to Brock Osweiler, Nicki Jhabvala of The Denver Post reports. Though the Broncos haven't announced a starting QB for Sunday's game against Washington, "all signs point to" Brock Osweiler getting the assignment over Lynch (ankle), the Denver Post reports. 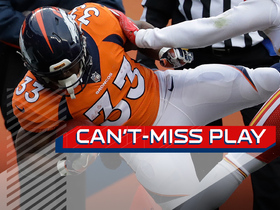 Analysis: Such an outcome would give Lynch some added time to bounce back from his ankle injury in advance of the Broncos' season finale Dec. 31. Though he's listed as questionable for Sunday's contest, per the report, Lynch is on track to suit up as the team's backup QB on Sunday. Lynch (ankle) is listed as questionable for Sunday's game against Washington after practicing fully Friday. Analysis: Coach Vance Joseph noted Friday that Lynch is at "about 90 percent" at this stage. Meanwhile, Joseph did not indicate whether Lynch or Brock Osweiler would draw the start at QB for Denver on Sunday, with a decision on that front slated to arrive following meetings later Friday. Lynch (ankle) was listed as a limited participant at Wednesday's practice, where he split first-team reps 50-50 with Brock Osweiler, Jeff Legwold of ESPN.com reports. Broncos head coach Vance Joseph (ankle) said Monday that he would like to see Lynch (ankle) play again this season, Troy Renck of Denver 7 News reports. Broncos head coach Vance Joseph said he expects Lynch (ankle) to receive full clearance to play in advance of the team's next game Dec. 24 against the Redskins, Troy Renck of Denver 7 News reports. Lynch (ankle) has been ruled out for Thursday's game against the Colts. 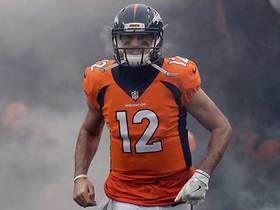 Analysis: With Lynch still recovering from a sprained ankle that he suffered back in Week 12, Trevor Siemian will continue to start at QB for the Broncos on Thursday, backed up by Brock Osweiler. Lynch (ankle) was listed as a non-participant on Monday's injury report, Zac Stevens of BSN Denver reports. Analysis: Lynch's inability to participate in Monday's walk-through isn't a great sign for his chances of returning in time for Thursday's tilt against the Colts. Trevor Siemian presumably handled the first-team reps at quarterback, with Brock Osweiler operating as the No. 2. Lynch (ankle) will remain out for Week 14 against the Jets, Jeff Legwold of ESPN.com reports. Analysis: Lynch will miss a second straight game while recovering from a high-ankle sprain that came with an estimated timetable of two-to-four weeks. He could get another look in the starting role if he's healthy before the end of the season, as Trevor Siemian was disastrously bad in Sunday's 35-9 loss to the Dolphins. Siemian nonetheless will get the nod over Brock Osweiler on Sunday against the Jets. Lynch is dealing with a high-ankle injury and is expected to be out for 2-to-4 weeks, Troy Renck of Denver 7 News reports. Lynch (ankle) is believed to have avoided a serious injury, potentially leaving the Broncos with a decision to make at quarterback heading into the Week 13 matchup with the Dolphins, Ian Rapoport of NFL Network reports. Lynch (ankle) wore a walking boot after Sunday's 21-14 loss to the Raiders and likely will be sent for an MRI on Monday, Jeff Legwold of ESPN.com reports. Lynch left Sunday's game against the Raiders with an ankle injury, Nicki Jhabvala of The Denver Post reports. Analysis: With Lynch injured and Brock Osweiler inactive Sunday,Trevor Siemian is back in at QB for the Broncos. Prior to his exit, Lynch completed nine of 14 pass attempts for 41 yards and a pick, while adding two carries for 20 yards. 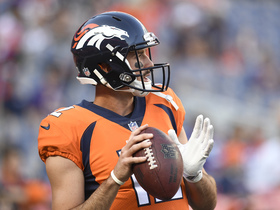 The Broncos officially named Lynch their starting quarterback for Sunday's game against the Raiders, Andrew Mason of the Broncos' official site reports. Analysis: Multiple reports confirmed Tuesday that Lynch would replace Osweiler atop the depth chart, so head coach Vance Joseph's announcement Wednesday was merely a formality. 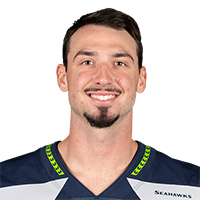 Though accuracy concerns in addition to a lack of recent game experience make Lynch a low-end fantasy quarterback in Week 12, he at least gets a soft landing spot against an Oakland defense that has yet to record an interception this season and is tied for last in the NFL in sacks (14). Confirming an earlier report, Lynch will start Sunday's game against the Raiders, Nicki Jhabvala of The Denver Post reports. The Broncos plan to make Lynch their starting quarterback for Sunday's game against the Raiders, a source informed Dan Graziano of ESPN.com, but the team has yet to formally announce a decision and likely won't until Wednesday. 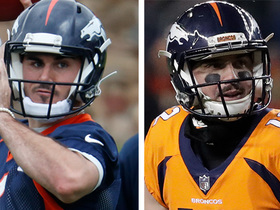 Broncos coach Vance Joseph suggested Monday that Lynch, Brock Osweiler and Trevor Siemian could all be options to start against the Raiders on Sunday, Nicki Jhabvala of The Denver Post reports. Lynch is listed as active Sunday against the Bengals. Analysis: Lynch is drawing ever closer to his first start of the season, but backup duties will be his domain for at least one more game as he supersedes Trevor Siemien in the pecking order. For the time being, though, the Broncos will entrust Brock Osweiler with the starting gig. Broncos head coach Vance Joseph said Friday that Lynch's performance during practice this week would dictate whether or not the quarterback is active for Sunday's game against the Bengals, Jeff Legwold of ESPN.com reports. Broncos head coach Vance Joseph was noncommittal when asked Thursday if Lynch would suit up for Sunday's contest against Cincinnati, Ryan Koenigsberg of BSNDenver.com reports. Lynch got work with the first-team offense during Wednesday's practice while Brock Osweiler was limited with a right shoulder injury, Jeff Legwold of ESPN.com reports. Lynch will receive the second-string reps at Wednesday's practice as the Broncos evaluate the progress in his recovery from a right shoulder injury, Mike Klis of 9 News Denver reports. Analysis: While he hasn't been listed on the injury report at any point in November, Lynch has been limited to third-string duties since he resumed practicing in late October. With the team sinking and Brock Osweiler failing to impress through two starts, Lynch likely will replace his veteran teammate before the end of the season. The Broncos seem to be gradually increasing Lynch's practice workload, perhaps eyeing Week 12 or 13 for a promotion to the top spot on the depth chart. Broncos head coach Vance Joseph named Brock Osweiler the team's starting quaterback for the Week 10 game with the Patriots while noting that Lynch isn't ready to contribute yet, Nicki Jhabvala of The Denver Post reports. "Physically he's been hurt," Joseph said Monday, in clarifying why Lynch wasn't ready to play. "He played his last football game in Week 3 of the preseason and he threw for four days prior to our last game. That's the physical part. The mental part, I was speaking more to that he hasn't played football. He hasn't been on the football field. He's missed so much time, so to put him in an NFL game Week 10 wouldn't be fair to our football team or fair to Paxton." Lynch could be named the Broncos' starting quarterback as early as Week 10 against the Patriots, Jason La Canfora of CBS Sports reports. Broncos head coach Vance Joseph said Thursday that Lynch would be inactive for Sunday's game against the Eagles, Jeff Legwold of ESPN.com reports. Denver Broncos wide receiver Emmanuel Sanders says a change of scenery will help Paxton Lynch. NFL Network's Mike Garafolo explains why the Denver Broncos still believe in quarterback Paxton Lynch and what to expect from him in 2018. NFL Network's James Palmer brings the latest information on the Broncos hopes for QB Paxton Lynch going forward. 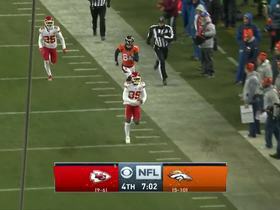 Denver Broncos running back De'Angelo Henderson sheds multiple tacklers on this 29-yard touchdown. 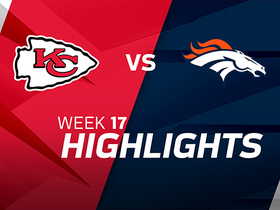 Denver Broncos quarterback Paxton Lynch lofts a 6-yard touchdown to wide receiver Demaryius Thomas to tie the game in the fourth quarter.